Michael Moore keeps a flag-draped box seat open at the Belasco Theatre for President Donald Trump. So far, the real estate entrepreneur and entertainer-turned-politician hasn't taken him up on an invitation to see "The Terms of My Surrender." Theater hasn’t been the place to find escapism this summer. In his Broadway debut, the disheveled, Oscar-winning raconteur’s first words on stage are: “How the (expletive) did this happen?” It’s escapism you were seeking? May I suggest you check the availability of “Hello, Dolly” tickets? Directed by Michael Mayer (“Hedwig”), whose penchant for pizazz pairs nicely with Moore’s Lefties-Home-Companion storytelling style, “Surrender” is a slick and engaging mash-up of entertainment and politics. It’s also very much a call-to-arms for civic involvement, in a room where—this being New York City—Moore is preaching to the more-or-less converted. Theatergoers at the Belasco will, on arrival, notice a mezzanine box with an American flag draped beneath. Those seats, Moore explains, are reserved for President Trump, who has yet to take him up on an offer to attend. Moore also extends the invitation in his Playbill bio … in both English and Cyrillic. “Surrender,” performed without an intermission, is sometimes, though not always, presented with celebrity guests. Bryan Cranston was a recent visitor; U.S. Rep. Maxine Waters was another. Structurally, it’s split neatly into a half-dozen or so 10 or 15 minute segments. The “Bowling for Columbine” filmmaker reluctantly acknowledges the president’s popularity in an opening monologue, reminding us that “The Apprentice” in its heyday had roughly four times the number of viewers as does “The Bachelorette” today. 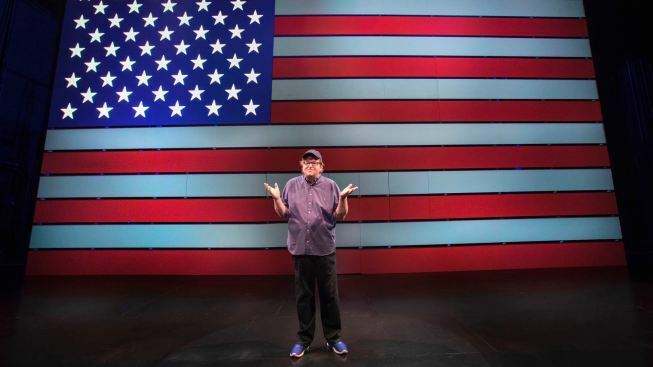 When there isn’t a mahogany desk on stage as a prop, or a comfy leather chair, Moore stands in front of a backdrop onto which is illuminated a giant American flag. Sometimes, a digital news ticker of President Trump’s more notable soundbites is projected onto the flag’s stripes. On Tuesday, the night I saw “Surrender,” I was impressed to catch the “fire and fury” quote about North Korea. President Trump had made his statement only hours before. An early “Surrender” segment has Moore dragging out his carry-on luggage to run down what he perceives as a civil rights-restricting list of TSA mandates regarding travel. For illustrative purposes, he has most of these items in the bag, and he removes them one at a time, after tossing aside a dozen or so baseball caps—a cute sight gag. More serious segments recount a 1985 trip to Germany to protest President Reagan’s visit to a German military cemetery. And there’s a devastating rundown of the poisoned water horrors still unfolding in Flint, Mich., where Moore was born. Another difficult part of the show comes when Moore recounts the death threats, and actual attempts on his life, that began after he became a public figure. In 2005, radio host Glenn Beck contemplated over the airwaves the ways he might “kill Michael Moore.” Moore asks us to consider whether we think such a thing might be legal, then stages a phone call to New York Gov. Andrew Cuomo, in which he uses a script of Beck’s threatening words, but directed to the governor. Moore tell us there’s been no response from the governor’s office … yet. If you’re wondering what Moore considers the “terms” of his surrender, he says so toward night’s end: Dump President Trump. And dump Vice President Pence. By its conclusion, “Surrender” becomes his plea to the audience to do something small, such as running for a local office, in an effort to change the country’s direction. This is a man so comfortable with confrontation, it would be fascinating to see him take “Surrender” on the road. I can think of a few places the audience wouldn’t be nearly as friendly as New York, which would make for an even more electrifying event. Unrealsitic? Too dangerous? Perhaps. Meanwhile, Democrats will take comfort here ... Libertarians and Republicans, not so much. “The Terms of My Surrender,” through Oct. 22 at the Belasco Theatre, 111 W. 44th St. Tickets: $29 and up. Call 212-239-6200.